When you hear discussion of cannabis in popular culture, much of the focus is centered on the psychoactive element THC. As more factions within science and medical communities continue to see therapeutic potential in CBD, it has become the cannabinoid with the most buzz. As such, CBD jobs producing, manufacturing and selling products have spiked to meet new demand. THC is the most abundant cannabinoid found in species of Cannabis sativa L., a crop which has been harvested for its structural qualities for thousands of years. THC binds with endocannabinoid receptors CB1 and CB2 in the central nervous system, as well as its periphery. When THC is ingested in its decarboxylated (active) form, it causes consumers to experience a range of physical and psychological effects such as euphoria, sedation, cottonmouth and racing heart. Depending on the qualities of individual strains, THC will induce different effects. Commonly, sativa strains encourage energetic, creative and attentive highs, while indicas have a strong relaxation effect on the body and a pleasant stone for the mind. Hybrids of course contain elements from of both strains. CBD is the acronym for cannabidiol and it is the second most commonly occurring cannabinoid in cannabis. Like THC, CBD is secreted from glandular trichomes. CBD is of particular interest to the medical community for its potential in dissuading breast cancer cell proliferation and gaining traction as an ingredient in treating inflammation and chronic pain. High CBD strains help to counteract the paranoia some individuals experience when they ingest too much CBD. 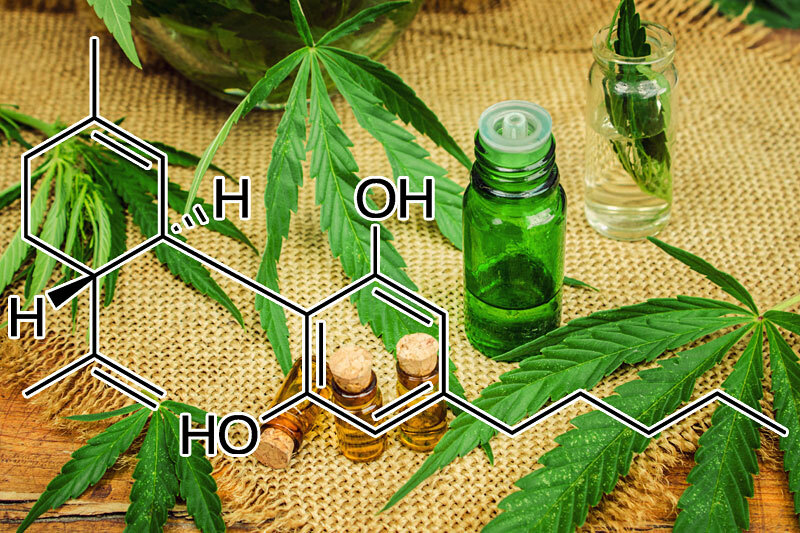 On the market today are CBD oils, which appear in varieties that are completely non-psychoactive, or split with THC. Besides being the cannabinoid most recreational consumers are concerned with, THC is also the element that helped cannabis-dissenters to continually pass prohibitive efforts. Despite the fact that there has never been a fatal THC-overdose in recorded history, cannabis has long been categorized as a Schedule 1 substance. This category deems cannabis to not only be devoid of medical benefits, but that it has a high potential for abuse. Put into context, other drugs such as opioids and cocaine are listed as having more medical efficacy and less potential for abuse than THC. For decades lasting until the end of the nineteenth century, cannabis was used in Europe and China openly. In Europe, it was the advent of pharmaceuticals like aspirin that kept cannabis (then known as hemp) from being considered medically beneficial. Now that CBD has finally begun to reach the mainstream weed audience, the newest thing everyone seems to be talking about are terpenes – and for good reason! Terpenes are hydrocarbons that can be found in many plant and animal species on earth. Terpenes happen to be especially abundant in Cannabis sativa and are important for a variety of reasons. Firstly, terpenes are extremely aromatic and therefore are responsible for the pungent smell of maturing cannabis flowers. In addition to providing a skunky smell, terpenes appear in strong smelling varieties of pine, grapefruit and clove, among others. Aside from the human element, terpenes are also important to protect the plant from pests. In relevance to CBD jobs, terpenes have natural medical potential in isolation, but also with CBD. When culled individually, many terpenes emit some of the same qualities as CBD, such as anti-inflammatory benefits and skin cell regeneration. The next phase of cannabis medicine will likely involve a broader inclusion of the diverse network of cannabinoids and other compounds secreted from cannabis trichomes. Now that CBD is finally getting some of the recognition it deserves, CBD jobs throughout all levels of the supply chain can be found in states where cannabis legalization measures have successfully been passed. Throughout most of world history, cannabis has been disproportionately bred to retain high levels of THC. CBD wasn’t on most black market growers’ minds and therefore was put on the backburner. Now, in order to get high levels of CBD, growers have to use breeds that are naturally CBD-rich or have been bred to be. Since CBD is used mostly as a therapeutic cannabinoid, most grow operations undertake great measures to ensure a lack of chemical interference from pesticides, herbicides, etc. CBD marijuana growing jobs will likely continue to trend as more varieties highlight the synergistic potential of equally match THC and CBD together in one strain. In order to find marijuana jobs working as a professional grower, most start out first working CBD jobs as a bud trimmer or assistant grower. Bud trimmers are more important than you might think. In fact, they are the ones to thank for the fact that you aren’t inhaling a thick, harsh smoke. Trimming helps to maximize cannabinoid content and add an aesthetic flare that the legal industry seems to be pridefully adopting. Machines and apparently robots are starting to replace human trimmers, but this job has been around as long as cannabis distribution has existed in colonized America. Assistant growers primarily help to maintain the grow space and will engage in daily and weekly watering and nutrient-related tasks, as well as optimizing humidity and airflow, light exposure, proximity, pests and so much more! Working as an assistant grower might not win you master marijuana grower salaries, but it can put you on the path to running your own professional operation one day. CBD jobs processing and manufacturing products requires cannabinoid extraction. This process helps to gather all the important cannabinoids in a malleable solid or liquid substance. There is a wide range of CBD products available for purchase in the form of edibles and oil supplements. The CBD jobs responsible for extracting all the useful compounds from cannabis plants are known as cannabis extraction jobs. Extraction technicians are some of the better paid individuals in the industry as they often come with relevant experience in the field of chemistry. For most extraction technicians, a high level of accountability is taken to ensure that each concentrate is as CBD-rich and pure as possible. Post extraction, the substances are often filtered to discard anything harmful or unnecessary. Cannabis extraction technician jobs come with a fair bit of danger in their job description. In and of itself, the process involves using industrial solvents and heat, which puts workers at the risk of starting a fire. that is why this is not a job for those who don’t feel confident working in a lab and recording their findings. In the legal industry, the extensive regulations that have been put in place at local and state levels requires thorough product testing. There has been a huge demand recently for lab technicians who have the skills to test products for chemical contaminants and for accurate CBD concentration. It can be very difficult to find paid CBD jobs in cannabis research. Because of its scheduling denomination, cannabis is ineligible for the kind of grants and funding that give researchers adequate funding and resources to conduct their experiments. CBD jobs in advocacy and lobbying are ideal for impassioned pot lovers who want to make a difference. Lobbyists are primarily responsible for informing policy measures on the issue they have taken on. Since politicians aren’t always the most well-versed in cannabis, many of them probably have never ever heard of CBD, much less are willing to consider its use in over the counter supplements. There aren’t all that many advocacy or lobbyist jobs out there, but starting off as a part-time volunteer is a good way to move into paid, full-time work. Cannabis dispensaries are undoubtedly one of the best places for entry level stoners to find CBD jobs. While most budtenders will have to sling both THC and CBD strains, dispensaries are increasingly upping their CBD-rich merchandise to meet customer interest. Individuals working marijuana dispensary jobs can be some of the most knowledgeable cannabis industry employees you come into contact with. Budtender jobs expose you to a massive amount of strains because of the sheer number that come in and out of the shop every day. This exposure allows budtenders to obtain a more widespread understanding of strain characteristics than most other people. Since budtenders usually get a nice discount of the company product, they are encouraged to experiment with different strains (offsite, of course) so they can provide helpful advice to customers. Even in recreational dispensaries, customers want to know how different stains might help their nausea or not make them paranoid. This is all in the budtender’s informational wheelhouse. Other CBD jobs you’ll find in dispensaries are the front desk staff. These receptionists are mainly responsible for checking customers in – processing and filing identification data to keep up with compliance. Receptionists don’t necessarily get the same hands-on experience as budtenders, but the position is a admirable entry level pursuit! Yet another CBD job you will come across in a dispensary is that of the marijuana dispensary hiring manager. This supervisory position certainly is not in-keeping with the lazy stoner stereotype. On the contrary, managers take on some of the industry’s biggest responsibilities, and they are held accountable for the actions of subordinates. On any given day, dispensary managers may be performing hiring related tasks, facilitating accounts with farms and processors, working budtending shifts – the list goes on. Not all dispensaries have them, but marijuana security guard jobs are found in some shops. These individuals usually perform the same ID checking tasks as bouncers and are rarely called upon to de-escalate issues. However, there have been cases of cannabis dispensary security guards being injured and even killed on the job, so the position should still be taken seriously. While THC can’t seem to escape the perpetual schedule 1, CBD appears to be moving into a more accepted future quite soon. Especially for its use for conditions like Dravet syndrome, more medical professionals are really taking CBD seriously. What is interesting about the current state of things is that the pharmaceutical industry isolate CBD and THC individually from prescription drugs. Unfortunately, these drugs will not be as effective as whole plant medicines contain a diverse landscape of compounds. Recently, there has been a particularly strong wave of activism toward furthering cannabis legalization measures. Hopefully new laws will provide more room for CBD to be available in a high-quality for for all of those who need it.